As a computer technician, here is a problem I have been coming across more and more. About 30secs to 1 minute after booting into Windows the computer starts lagging heavily. When CTRL+ALT+DEL is pressed it shows that svchost.exe is using up maximum CPU resources and only occurs when Automatic Updates is enabled. Microsoft has recognized this problem and has released a patch. However, on all computers I have worked on with this problem, the Microsoft patches don’t fix the problem. 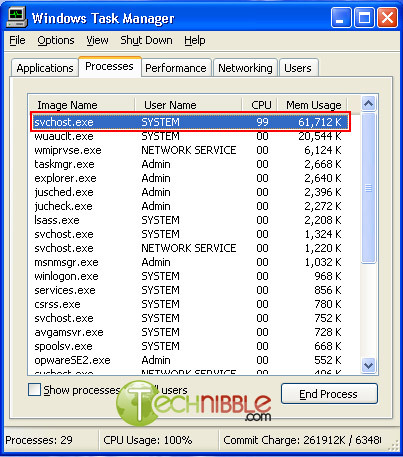 This is a guide on how to fix this problem with svchost using maximum CPU. Once Windows has loaded and you have the option of which user account to use, log on as “Administrator”. Click Start > Run, choose the Browse button and find the fix_svchost.bat file you saved before, press Open, then OK.
A black screen will pop up and white text will scroll past. Wait for this process to finish as it could take several minutes. It will close itself when its finished. Once the black screen disappears, Click Start > Run, choose the Browse button and find the WindowsUpdateAgent30-x86.exe file you saved before, press Open, then OK. Follow the prompts as it installs. When Windows Update Agent finishes installing, Click Start > Run, choose the Browse button and find the WindowsXP-KB927891.exe file you saved before, press Open, then OK. Follow the prompts as it installs.